How less are the Homeless? Posted On January 15, 2015 by &filed under Legal Articles. And again I woke up to see the same people lying on the roadside having no shelter to cover their head. Sixty seven years have been counted since we gained our independence to again to succumb to trap of poverty, malnutrition, corruption, rapes, illiteracy and many more things in queue. A chain of thoughts ran into my mind that where from these poor neglected people come from to occupy the footpaths for their sleep which are genuinely meant for walk, were they born homeless/vagrants, does our government have any policy/plan for them and for their safety, does these homeless creatures bother are government, why numbers of homeless people are swelling in, what is their future?………. and so on. Taking an example form national capital, Most of the homeless in Delhi comprise of migrants, coming from rural areas, looking for work but a lot also enter from neighboring countries like Bangladesh and Nepal. The migrants include both skilled and unskilled laborers. They pull rickshaws, work in dhabas or tea stalls, work on construction sites and learn carpentry or painting. More and more people are coming into the city, looking for work and hoping that their dreams have a better chance of actualizing with the resources the city has to offer. They come to earn a better livelihood and increase their standard of living, and in reality, they end nowhere and take these odd jobs. To overcome this amok situation like homelessness in New Delhi, the government introduced abandoned bus shelters as night shelters in a desperate move to protect the city’s homeless people from the bitterly cold winter, this initiative failed due to the myriad number of needed people and meager number of buses available, deterred condition of theses buses was also contributing factor making this move ineffective. Housing is a basic human need, yet the statistics of United Nations Commission on Human Rights in 2005 notes that, an estimated 100 million people -one-quarter of the world’s population- live without shelter or in unhealthy and unacceptable conditions. Over 100 million people around the world have no shelter whatsoever. The health consequences of this level of homelessness are profound. 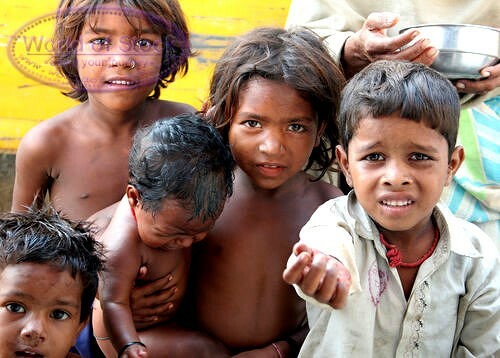 The Action Aid in 2003 had found out that there were 78 million homeless people in India alone. CRY (Child Relief and You) in 2006 estimated that there are 11 million homeless children live on the street. The statistics are grim. What is worse is that very little is known of what it means to be part of such horrific numbers. Reckoning the condition in India, with a population of well over 1 billion people, India is the second most populous nation in the world. According to UN-HABITAT, India is home to 63% of all slum dwellers in South Asia. This amounts to 170 million people, 17% of the world’s slum dwellers. India’s per capita income, although rising, rank’s it 124th in the world. This low per capita income is one factor that marks the sharp divide between India’s wealthiest and poorest citizens. Approximately 35 percent of India’s 260 million people (a group almost equal to the entire population of the United States) still earns $1 or less a day. And according to the United Nations, 70 million people earn less than $2 a day. As India continues to grow in economic stature, there’s much debate over the country’s ability to tackle poverty and urban homelessness. A 2001 census reported that 78 million people across India were living without a home, many in overcrowded urban environments. In absolute terms, urban population saw a rise in homeless population from 7.78 lakh people in 2001 to 9.38 lakh people in 2011, but rural areas witnessed a decline from 11.6 lakh people to 8.34 lakh people. However, Uttar Pradesh had the highest proportion of homeless people in the country. Of the total homeless, 18.56% was in in UP, followed by Maharashtra (11.9%) and Rajasthan (10.24%). Homelessness in rural areas is mirrored by an almost equal rise in urban areas. As the homeless declined by about 66,000 households in rural areas, it went up by about 69,000 households in urban areas, recording a growth rate of 20.5% as against a decline of 28.4% in rural areas. The judicial system claims a place of pride in Indian polity. However unprecedented increase in litigation coupled with pending backlog of cases has resulted in long delays in administration of justice. Lack of awareness and access to justice by public at large also continues to be a problem. As per the report published by World Justice Project, titled as ‘Rule of Law 2012’, which provides country-by-country scores and rankings on several parameters on rule of law, India ranks 78th among 97 countries in guaranteeing access to justice. Again in the case of Shantisar Builders V. Narayan Khimlal Totame, the Supreme Court has ruled that the right to life is guaranteed in any civilized society. That would take within its sweep the right to food, the right to clothing, the right to decent environment and a reasonable accommodation to live in. The hon’bl court also said that the difference between the need of an animal and a human being for shelter has to be kept in view. For an animal it is bare protection of the body; for a human being it has to be a suitable accommodation which would allow him to grow in every aspect – physical, mental, and intellectual. Very recently, In 2012 Supreme Court has also held that having Night Shelter is a fundamental Right in this context, the court directed northern states of Jammu & Kashmir, Himachal Pradesh, Uttrakhand, Punjab, Haryana, Rajasthan, Uttar Pradesh & Bihar to provide at least temporary night shelters to preserve and protect the lives of homeless people in consonance with the philosophy of the constitution u/art 21. A wide array of factors contributes to homelessness, but they can be thought of as falling into one of two categories: Structural problems and Individual factors that increase vulnerability. In this regard Mahatma Gandhi has said that –‘Whenever you feel low, think about a poor man and see whether your step will improve the condition of that poor man. I personally believe that new strategies, plans, schemes should be based on this principle. As the new government with new plans has assumed power at Centre, People of this country are optimistic regarding the reforms, development and everything they wish for. In this regard new government has introduced many new schemes like Make in India campaign, Making 100 smart cities, and swacch Bharat, these smart moves are indeed welcomed. India needs smart cities which could generate employment, a standard form of living, education, health facilities to its people. But government should reckon on those cities first which are not yet smart but can be so, if they are made so. Making those cities smart which itself are well titivated will make no deal and end up in encumbering these cities more by attracting more people from other cities. So, in other way, government should focus on such cities first which have the potential to have that smartness in them. This strategy will come up with many solutions like, in helping overcrowded metros like Mumbai, New Delhi, Pune, Hyderabad, Kolkata, Chennai, Bangalore, and Ahmedabad etc., As people who are in search or are working in these overcrowded metros will shift to those cities which much nearer their houses which will automatically provide loose space in these packed metros. Government first focus should be on such states from where the migration rate is higher; taking an example of densely populated Uttar Pradesh, Two- tier Cities like Kanpur, Lucknow, Varanasi can generate employment and other sources for living, if government focuses on these cities. On the other side, government should also provide the helping hand to the business houses that come forward in setting up their business in such Two-tier cities. As also rightly said that, the key to being effective is to take states along, that, all the state government along with central government should work in unison rather than in isolation. As, India cannot be regarded as developed if any one of its state is left behind in destitute. Unity has always been the rule, if we follow it, India will progress soon, as India is born rich with its natural resources. Writer’s say… Shelter for a human being, therefore, is not a mere protection of his life and limb. It is home where he has opportunities to grow physically, mentally, intellectually and spiritually. Right to Shelter, therefore, includes adequate living space, safe and decent structure, clean and decent surroundings, sufficient light, pure air and water, electricity, sanitation, and other civic amenities like road etc. so as to have easy access to his daily avocation. He right to shelter, therefore, does not mean a mere right to a roof over one’s head but right to all the infrastructure when used as an essential requisite the right to live, should be deemed to have been guaranteed as a fundamental right.